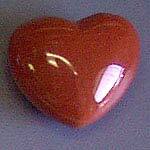 These Heart Stone crystals all have a different meaning, and are popular gifts for friends, relatives and lovers. 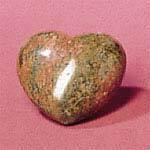 Let people know that you care about them with these unique Heart Shaped Polished Stone carving. Each one comes with a card explaining the meaning behind the stone. 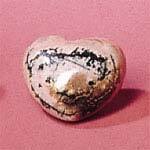 These stone hearts are 1.7 by 1.2 by .75 Inches and sell for only $7.49 each. But if you buy more than one you get a discount on the price (even if you mix and match different styles). 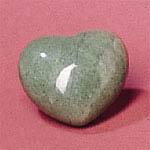 A peaceful green color, Aventurine is believed to act as a soothing stone. Dynamic red with gray streaks, Brecciated Jasper is believed to keep energy high. 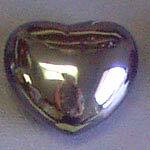 Metallic dark silver / gray color, Hematite is is believed to enhance memory. 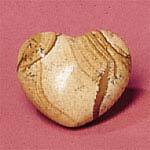 Creamy vanilla color with cinamon streaks, Picture Jasper is believed to enhance Pictures from the past. 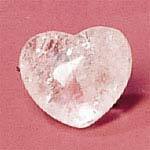 A clear stone with internal lines, Quartz Crystal is believed to amplify energy thoughts. A sparkling orangish-red color, Red Goldstone is believed to tune in to ancient echoes. 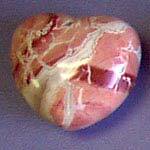 A pink stone with mauve tones and gray streaks, Rhodonite is believed to allow for change. 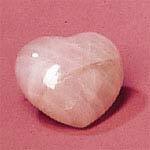 Opaque rose pink colored stone, Rose Quartz is believed to promote love. 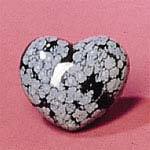 A near black stone with off-white designs, Snow Flake Obsidian is believed to enhance serenity. 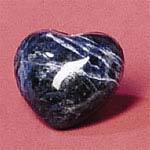 A deep blue stone with white streaks, Sodalite is believed to eliminate confusion. 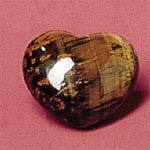 Medium and dark browns, Tiger Eye is believed to connect one with earth. A moss green and Raspberry Red color, Unakite is believed to bestow peace & quiet.